I’d recently started sewing, and this seemed like a project I could tackle. I took apart a neckwarmer I already had to see how it was put together, consulted with a couple of friends who are far better at sewing than I am, and promptly began turning out some trainwrecks. Eventually, things started to come together. I optimized the process so I could make one in less than the 3 hours each it took to make the first few. I put a few on Etsy and got a good response, even a few requests for custom designs. I’m really excited to find that other people have the same sense of humor and fashion (although I use that term loosely) as I do. My dream at the moment is to be able to chase after a random stranger I see on the streets, yelling “Hey! I made that!” The odds are getting better and better every day. The neckwarmer is made from two pieces of fleece: one color called “camel” (how appealing!) and one “charcoal.” A single piece would be a lot easier, but I think the look is really made by the way it angles along the jawline and mimics the shape of the face. It’s double-layered, and because the two layers are only attached at the seam it can be “rolled” to place the mustache in a different location in relation to the top of the neckwarmer. 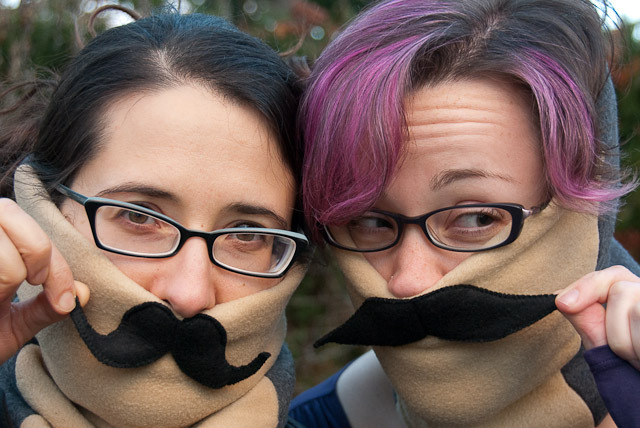 The mustaches are also made from fleece. Usually three layers, stitched around the edges. The extra layers give the ‘stache some volume and rigidity, so that the handlebars will stand out appropriately. They’re attached to the neckwarmer down the middle and partway across the top, so that the ends are free to pop out.